Midsummer is the day us Swedes celebrate the arrival of summer and the longest day of the year. It’s naturally a pretty big deal to a country that spends the majority of the year veiled in darkness and cold. For an outsider, the celebration may seem a bit misguided as decades of midsummers past document very little proof of summer. About 90 percent (just throwing a non-scientific, but highly likely number out there) of the time, Swedes yearning for that warm kiss of the sun spend midsummer stubbornly sitting outside in barely admissible temperatures. We’re packaged tightly in scarves and rain coats eating midsummer feasts rendered soggy and cold by the weather gods. Because on midsummer, we will act as if it is summer, we will wear summer dresses with rubber boots if need be, and we will eat strawberries through chattering teeth because we have waited long enough. Summer is here. With or without the sun. Ask any Swede and they will tell you that strawberries are a number one priority for midsummer. 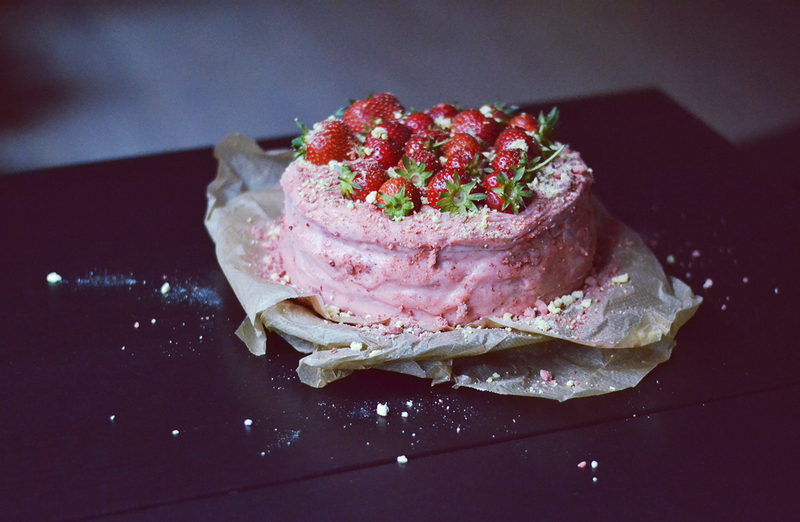 So for midsummer this year I made a Strawberry & Peach Cake. The cake is four layers of peach sponge intersected with strawberry purée and topped with strawberry buttercream, decorated with fresh strawberries and a crumble of crushed freeze dried strawberries and peaches. Quite the stunner if you ask me. Preheat oven to 175 C / 350 F and butter two 8 inch round cake pans. Drain the three cans of peaches in a colander and rinse if coated in syrup, allow all the liquid to drain before transferring to a food processor and blending the peaches to purée, leaving a couple of bigger pieces, to add a nice texture to the sponge cake. Set aside. In a medium bowl, cream together the butter and sugars using an electric whip. Add the peach purée and apple cider vinegar and mix again. In a separate bowl, sift together the flour, baking powder, baking soda, salt and cinnamon. Slowly mix in the wet ingredients to the dry using the electric mixer, and then give the batter a couple of twirls with a spatula. Pour equally into the two cake pans (or half the batter at a time if you only have one cake pan) and bake for about 25 minutes, until a toothpick inserted comes out clean. Cool completely. Note: I prepared the sponge cake the day before, wrapped the cooled cakes in plastic foil and let them sit in the fridge over night so they were cold for cutting and assembling the cake. For the strawberry purée: combine all the ingredients in a food processor, blend until completely combined. For the frosting: purée the strawberries in a food processor, set aside. Using an electric mixer, cream the butter and then slowly add in the powdered sugar. Press the puréed strawberries through a sieve and mix until completely combined. 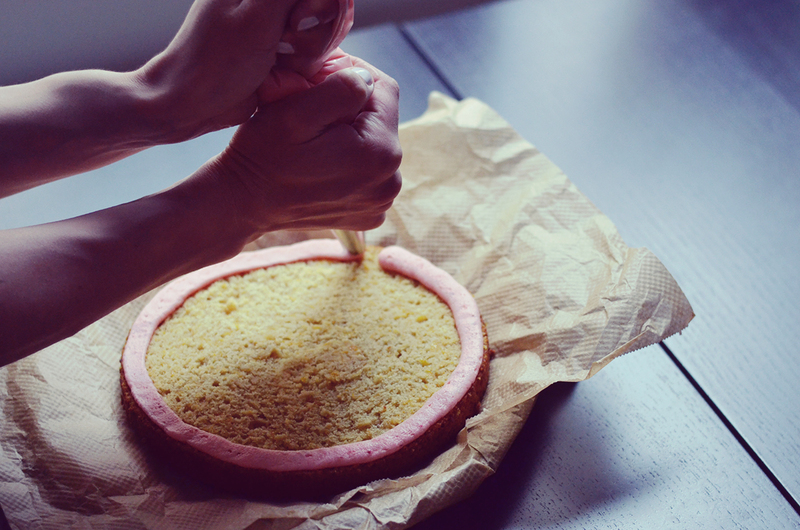 To assemble the cake: Cut each of the two cake bases in half, pipe a ring of frosting around the edge of the first base and then fill the centre of the ring with the strawberry purée (as pictured below). Add another layer on top and repeat the process until all four bases are layered on top of each other. 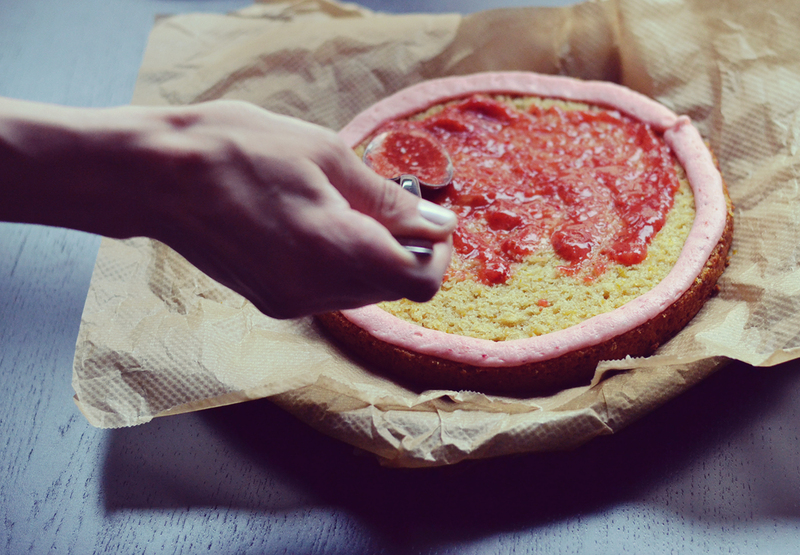 Then frost the entire top and sides of the cake and place the fresh strawberries on top. Sprinkle the crushed freeze dried strawberries and peaches on top and along the sides. Store in the fridge until serving.